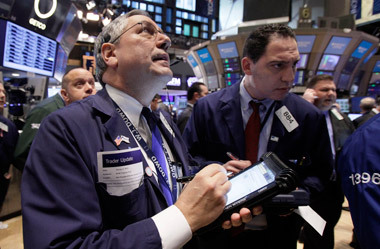 The Dow Jones reached a new high Wednesday on strong U.S. economic news (Photo: AP). Consumer spending is poised to grow in 2015 as stronger employment and lower gasoline prices boost household buying power, one reason why the Federal Reserve will probably raise interest rates next year. Other aspects of GDP — inventories, trade and government spending — are likely to moderate, indicating growth will ease at the end of 2014. And durable goods orders declined last month, another sign last quarter’s surge may not be maintained. Stocks rose after the figures, with the Standard & Poor’s 500 Index advancing 0.2 percent to 2,083.54 at 11:30 a.m. in New York. The yield on 10-year Treasuries was 2.20 percent compared with 2.16 percent late yesterday. Today’s GDP estimate is the third and final for the quarter and followed a 4.6 percent advance from April through June. The economy grew at an average pace of 1.3 percent in the first half of the year after expanding at a 2.2 percent rate in all of 2013. Household purchases, which account for almost 70 percent of the economy, rose at a 3.2 percent annual pace, compared with a previously reported 2.2 percent. The revisions reflected stronger spending on health care, recreation and financial services than previously estimated. Outlays on durable and non- durable goods were also revised up. Personal consumption added 2.2 percentage points to growth. It rose at a 2.5 percent pace in the prior three-month period. Business investment was also revised up across the board, with bigger gains reported for spending on construction projects, equipment and intellectual property, which includes software and research and development. Another report today showed similar advances will be difficult to match this quarter. Orders for durable goods, which are those meant to last at least three years, unexpectedly dropped in November, according to Commerce Department data. Demand for computers, metals and electrical equipment declined or was little changed last month as the global economy cooled. A smaller trade deficit added 0.8 percentage point to GDP growth last quarter, today’s report showed. That will also probably be difficult to replicate at the turn of the year as a global growth slowdown hobbles exports and gains in consumer spending draws in more imports. Today’s report showed federal government outlays added 0.7 percentage point to third-quarter growth as federal defense spending jumped by the most since 2009. Total government spending rose at a 4.4 percent pace. Plunging prices at the pump are giving Americans extra cash to spending elsewhere. The average price of a gallon of regular gasoline fell to $2.38 as of Dec. 22, the lowest since May 2009, according to motoring group AAA. Job growth on track for its best performance since 1999 also is helping to keep up domestic demand. Employers added 321,000 to payrolls in November, raising the monthly average so far this year to 240,910. Last year, the U.S. economy gained an average 194,250 jobs per month. The central bankers in October ended an unprecedented monthly asset purchase program that swelled the balance sheet to more than $4 trillion.